Sprint's 4G, condensed: Be afraid, be very afraid. Buying a 4G phone on Sprint right now is a gamble, WiMax is in peril - and usable Sprint LTE could be a long way off. Do not want. But, the price is right. Sprint's 4G is a tale both of woe for America's comeback carrier and of joy for customers. Sprint offers, without a doubt, the most competitive smartphone plan pricing of any major carrier in America: all you can eat everything for just $69.99* (plus applicable 4G and smartphone fees). Well, even with the asterisk-attached 4G smartphone tax, Sprint still is an attractive option for the penny-pinching consumer - assuming Sprint 3G (let alone 4G) coverage is available in your locale. A sizable portion of Sprint's 3G coverage outside of major metro areas still relies on roaming agreements with other service providers, something that has to be costing the company some serious bucks. Still, Sprint customer satisfaction generally remains high, probably because of the unabashed success of the world's first "4G" smartphone: the HTC EVO 4G. At least five of Android Police's staff are (mostly) happy EVO 4G users, and I see the EVO 4G in the wild more often than any other Android device in Los Angeles. Sprint 4G speeds in Los Angeles County are no joke, either - users report anywhere from 3-10Mbps down and about 1-1.5Mbps up, and that's not shabby. But all is not well in paradise, in fact, there's a lot of buzz that Sprint will be switching to LTE later this year. CDMA 3G and LTE 4G, that sounds like a familiar combination. Could it be that Sprint's lone-dog status as a WiMax provider is coming back to bite it in the rear? It sure seems like it, and I doubt manufacturers are very excited about building versions of their handsets and software that work on exactly one network in the world. Will Sprint let WiMax flounder after 2011? Given the company's oft-questioned financial stability, investing in two 4G networks probably isn't something NASCAR's biggest sponsor can in good faith burden its balance sheets with. I'm sure Sprint will end up taking some heat from customers who preemptively purchased 4G handsets in the hopes that WiMax coverage would soon grace their more suburban homesteads. The future of Sprint's 4G is a big question-mark, and that's not good for consumers who have to choose between multiple carriers, all of them offering more concrete 4G roadmaps. T-Mobile's 4G in a nutshell: If you live in an area where T-Mobile has strong 4G coverage, a 4G phone is probably worthwhile. It's also pretty cheap. But if you're like most of America, your four-gees will feel a lot more like three (or less). Also, who knows what T-Mobile's LTE plans are. T-Mobile is home to some of the earliest Android adopters in the US, since the days of the first Android phone: the G1. And for that reason, many T-Mobile users are loyal fanatics of the Bellevue-based arm of Deutsche Telekom (I also tend to think most of those fanatics are, in fact, in Seattle / Bellevue / Portland). T-Mobile offers smartphone plan pricing second only to Sprint in economy, and with substantially better 3G/4G coverage. T-Mobile uses HSPA+ as its 4G tech of choice, which, according to the people that write the rules on 4G, isn't 4G (well, neither is LTE, apparently). Semantics aside, T-Mobile's been wasting no time in asserting itself as the carrier with the "largest 4G network" in the US. Wow, exciting - bigger than Verizon's current LTE coverage? Yes. But, there's a big, ugly caveat to that statement: the speed of that "4G" varies massively depending on region. If you live in one of T-Mobile's "big three" coverage zones (New York City, Los Angeles County, Greater Seattle Metro), great! 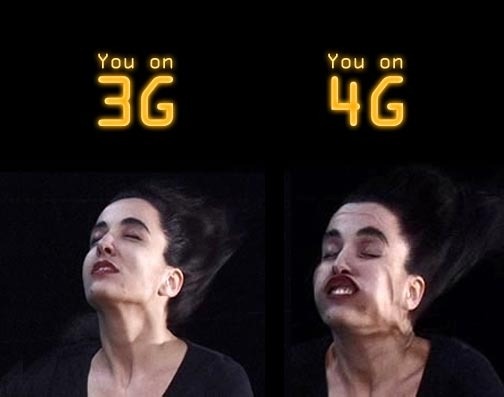 Your 4G will probably be, in ideal conditions, pretty speedy. The Samsung Galaxy S 4G managed to pull 10Mbps out of its hat in an MSNBC test, which presumably took place in New York. Things get bad, though. The Consumerist tested T-Mobile's 4G in an unknown location that offered 4G coverage, and couldn't break the 1Mbps mark. That's not exactly scientific, but it shows how malleable T-Mobile's definition of "4G" is. How does this happen? T-Mobile's 4G doesn't actually require the construction of any additional cell towers or major upgrades to network hardware. In fact, all HSPA+ requires carriers to do is attach a couple more antennas to their existing HSPA 3G towers, and do a little bit of software tinkering. I'm hugely oversimplifying the process here, but basically, it's not nearly as expensive an investment as LTE, and the network bandwidth isn't actually increased, only the end-user speed caps. HSPA+ has another drawback - peak speeds drop off dramatically the further you get from the access point, much more dramatically than standard HSPA 3G, CDMA, or LTE. This has to do with the natural limitations of the technology, though later (years from now) iterations may mitigate this problem to some extent by using a wider frequency range. T-Mobile hasn't announced any plans to implement LTE, but I wouldn't be surprised if their customers start to find HSPA+ a little limited a year or so from now. AT&T and the 4G: Buying an HSPA+ "4G" phone on AT&T may never feel quite like 4G. That said, AT&T's 3G is pretty snappy, so their HSPA+ should be pretty snappy, too (eg, better than T-Mo's). Waiting for LTE won't be as bad as Sprint, but wait you will, and then you'll wait some more - for coverage. And you'll have new and exciting speed/data consumption tiers to pay for once you get that coverage. Woohoo! America's second most popular carrier (depending on who you believe) has finally gotten on-board with the 4G craze. Last to the fight, AT&T's 4G plans sound downright aggressive - and that may be cause for concern. AT&T already has two 4G phones you can walk into any brick-and-mortar AT&T store and pick up right now. You might even be able to keep your old unlimited data plan. Exciting stuff. As you're all probably well-aware, the two 4G phones AT&T currently offers are the HTC Inspire and the Motorola ATRIX. As you may also know, both are HSPA+ devices. I reviewed the Inspire 4G and was generally happy with it as a phone. What I wasn't happy with was the 4G aspect. Unfortunately, AT&T does not seem to have gone about actually turning on its HSPA+ network, presumably because the backhaul isn't complete. That's fine, though I would have liked a little notice from AT&T in regard to that, or at least some availability estimates. AT&T apparently plans to provide HSPA+ to the entirety of its current 3G network, ambitious indeed - as this will also potentially increase speeds for 3G HSPA devices incrementally. But until I see it, I'm hesitant about how much of a real-world-effect this network upgrade will have given AT&T's extremely iPhone-burdened network. As I've said numerous times, AT&T's 3G isn't slow. Where there is 3G coverage, AT&T generally eats Verizon (and everyone else) for breakfast in the download speed arena. The complaints start arising when discussing AT&T's call quality and coverage. Still, AT&T out-covers T-Mo and Sprint by a significant margin, and its 3G speeds in metropolitan areas are unmatched (I get upwards of 3.5-4Mbps down in downtown LA). And, if you have an unlocked HSUPA device or an iPhone, your upload speeds on AT&T will easily reach 1-1.5Mbps. So how much better can AT&T's network really get with the addition of HSPA+? But AT&T's no one-trick pony, they plan to start offering LTE coverage in the second half of this year. Ambitious, indeed. So why even bother with HSPA+? I think I have an answer, and it starts with "i" and ends with "Phone." Far be it from me to speculate about the plans of the world's most secretive hardware developer, but something tells me Apple isn't ready to hop on the LTE bandwagon just quite yet. As the Thunderbolt's pricing has demonstrated, LTE radios may not exactly be cheap at this point, and LTE coverage will take a couple of years to get close to matching current 3G. I'm willing to bet when we see Steve Jobs (or whoever) get on stage to unveil the latest iPhone this year, it'll be packing HSPA+, not LTE (I highly doubt a Verizon LTE model, either) - because consumers want 4G that "just works, everywhere." Oh, and when AT&T's HSPA+ backhaul is complete, they'll be able to call themselves the nation's largest 4G network, so T-Mobile better get all that it can out of that size-queen marketing tiara before AT&T steals it. Just sayin'. So, we've established motive for AT&T's HSPA+ crusade, what about LTE? Honestly, I wouldn't expect too much action in that arena until next year. AT&T will have to play catch-up with Verizon, and the iPhone will likely make the switch to LTE for both carriers, so that Apple can buy all those LTE radios in mega-bulk. At that point, AT&T will have to compete to stay relevant. I wouldn't say AT&T's LTE will get dwarfed by Verizon's, but I don't think it'll be beating it any time soon. Regardless, AT&T's 4G plans are nothing to get excited over - for now. But, compared to T-Mobile and Sprint, the 4G future's looking a lot brighter on that AT&T side of the fence. Not to mention AT&T's massive lineup of Android devices in the coming year. Verizon 4G, is it for me? Almost definitely yes. If you need 4G connectivity now, Verizon is undoubtedly going to be your best bet to get it. As soon as they release a 4G phone, which will be at some point soon (?). Also, expect to pay. A lot. You know, Verizon reminds me of a certain other red fellow known for making long-term, binding commitments that play off people's desires to have what they want. Hm. This shouldn't be much of a surprise to anyone. Already in possession of the US's largest 3G network (though not always the fastest), Verizon has advertised its 4G LTE network en-masse since late last year. Observed speeds have gone all the way up to 20Mbps and beyond in ideal conditions, and Verizon advertises a range of 5-12Mbps. The speeds don't sound that unbelievable, but that's not really what makes Verizon's 4G effort the most serious to date - it's the promise of coverage. By 2013, Verizon plans to have the entirety of its current 3G network covered by 4G. Given that Verizon's 3G coverage in terms of sheer square mileage vastly exceeds any other carrier, this is a big promise. But it's one they're likely to keep - because while technologies like HSPA+ and WiMax can sometimes match Verizon's practical speeds in major metropolitan areas, it's Verizon's breadth and contiguity of data coverage that has made it the country's most popular provider. Verizon was the first to reach out to the suburbs with real 3G coverage, and they're probably going to be the first to do it with 4G, too. Even with the damaging delays and rumors that plague the Thunderbolt every day its launch goes unannounced, it is undoubtedly the most anticipated Android handset to date. And 4G is the flagship feature. The EVO 4G didn't generate anything close to this kind of hype, and that was the "world's first" 4G smartphone. Also, what the hell is LTE? LTE is the "next step" up from HSPA - and really, for purposes of terminology it's still 3G. LTE Advanced will be the first "true" 4G mobile data standard, but that's a long way off. LTE does a lot of things better than its predecessor - hugely increased bandwidth (up to 326.4Mbits on a 4-antenna setup), much-reduced latency, larger maximum coverage radius (better reach in rural areas), better data connection at high speeds (eg in your car, on a train), and higher call quality. It requires lots of shiny, new network equipment and antennas - so a lot of capital is needed to make a nationwide rollout happen. Anyway, you can bet Verizon doesn't have any plans of losing the 4G arms-race, and given all the confusion as to what really constitutes "4G" and therefore who has the most 4G coverage, they're really going to have to win it by doing it better than everyone else instead of just saying it. Supposedly Verizon's 4G already covers 100 million people in the US, but without a coverage map, the sense I get from that is "most major cities." Still, one can't help but feel that Verizon's 4G rollout is moving at a pace that makes its competitors' efforts seem inadequate. The 4G wars will be won on the streets of suburbia, where over half of all Americans reside - and this is why Verizon remains the most (again, subject to your source) popular carrier in the US. If Verizon can push 4G to the outcrops of major population centers before the competition, its dominance in the marketplace will only grow. As always, there's a caveat: Verizon's moving to tiered data plans for its 4G - and they're not sure if it's going to be just about data consumption, or both consumption and speed tiers. Yuck. And you can bet it's going to be a fantastic experience paying for the four-gees on your bill every month if you want all the gee-bees as fast as you can possibly consume them.